BANGI, 9 June 2014 – A total of 108 students have registered for the new ASASIpintar programme for the 2014-2015 academic session at The National University of Malaysia (UKM) here last week. They are a mix of current PERMATA students and new students selected from other schools who had all obtained at least 9 As in the recent Sijil Pelajaran Malaysia (SPM) exams. Deputy Director of the National PERMATApintar Centre Associate Prof Dr Mohd Arif Ismail congratulated them for their selection saying that they should feel lucky to be selected for the programme when speaking at their pledge taking ceremony. He gave a short narration of the visions of the country’s nationalists who had struggled for the establishment of UKM to be a showpiece of national aspirations and to be as strong as other universities. And in the 100 years since its establishment UKM’s graduates have lifted the good name of the university even on to the world stage, Dr Mohd Arif said. UKM, he said, have many niche research areas as well as being known for its academic achievements and community outreach programmes. 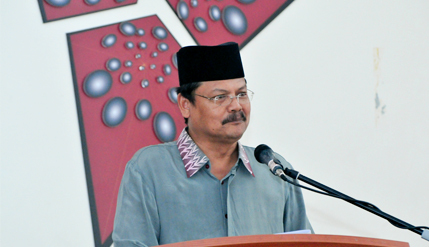 That was the reason why the PERMATApintar programme was established in UKM which had proven its worth in academia so as to ensure that the needs of the PERMATApintar children are met, Dr Mohd Arif said.